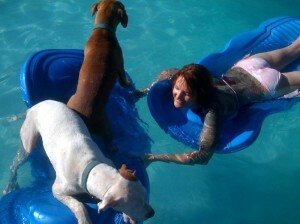 Humane Society for Shelter Pets – Is Your Pet Ready for Swimsuit Season? Spring Break is coming and many of us are concerned about our bathing suit readiness. We are not alone. Our companion animals, particularly dogs, cats and horses, are weathering the same winter storm. Nutritionists have made it clear that fat is not bad for you. In fact it’s needed for brain functioning. But since it packs double the calories per serving size, portion control is key. Just like our pets, we are not always satisfied by the portions recommended on food labels. But unlike our pets, we have only ourselves to blame. Pets count on us to dole out the rations. Pets rarely shop, so why are they doing so poorly in the battle of the bulge? According to AVMA, obesity is a major problem for pets and complications resulting from obesity include diabetes, hypertension and joint disease, not to mention a shorter life span. Most of us have heard about high protein diets commonly known as the Atkins plan (or the currently trendy “Paleo Diet”). Research is out there but results conflict. It turns out protein is great as long as it is of a high quality. Corn and wheat gluten are significant ingredients of pet food to help boost protein content. But meat is a better protein source for obese pets. The trend to feed grain-free foods to cats and dogs can address some of the problems that obese pets face. For horses, high quality fats can balance out low quality grains. Some diet pet foods are very effective. Pets feel full while eating fewer calories. But cats don’t have sweet taste receptors at all. So some cats simply won’t eat diet foods no matter how they are enhanced. High quality protein is the only way out. Besides, obese cats who refuse to eat can become dangerously ill in just a few days of fasting. Pet food companies understand that pets adjusting to a new environment tend to prefer something similar to what they already know. When looking for a food a fat cat will eat, find one that is similar in shape to his regular food and treated with high quality fats for palatability. Homemade pet food is an option for the short term but it’s not easy to create a diet that’s convenient to store and accounts for all the vitamins and minerals needed for long term nutrition. Just like with people, reducing calories may halt pet weight gain, but to actually lose weight, we may have to increase calories burned, otherwise known as exercise. By adding another walk to your dog’s day, you can burn off 20 lbs. in one year. Your dog will fare even better. Insulin resistance in horses, known as Equine Cushings Disease and Type II Diabetes in Dogs and Cats are linked to obesity so closely that weight loss alone often leads to elimination of symptoms completely. This spring, pay attention to the ingredients in your meals and think of how you and your pet can get back on the road to health…by walking on it!